Restated another way, the Commission will look at three things: activities that enhance people’s confidence in elections, activities that diminish people’s confidence in elections, and vulnerabilities in elections. After a period of time analyzing these things the Commission will deliver a report to the President with their findings. So, who will be making these determinations? The members of the Commission are listed below. Twelve people sit on the Commission. They are lawyers, government officials, politicians, and business people. Given the objectives of this Commission, the commissioners should be versed in what voters think of elections, how elections should work, and technological concerns surrounding elections. For purposes of this post, their experience in four areas are covered: conducting elections, experience with the law, experience with technology, and whether they have held elected office. Elections do not just happen. Conducting an election is a grueling experience that the majority of people are completely ignorant of. Of the twelve people on the Commission only four have experience actually conducting elections: Connie Lawson, Mark Rhodes, Hans von Spakovsky, and Alan King. This is a depressingly low number. I wonder, how many of the other commissioners have volunteered as poll workers? But wait! There are Secretaries of State on the Commission. This is true. The Secretary of State is typically the chief election officer in their state, however, they are not responsible for maintaining the voter registration rolls, maintaining voting machines, or dealing with the day to day decisions and actions involved in making sure elections happen. A Secretary of State does not conduct elections. If you haven’t spent an eighteen hour day putting out fires how are you supposed to understand how an election should run and the common problems that occur during the conduct of an election? The Commission would have greatly benefited from having Doug Chapin, or Ion Sancho (full disclosure; I used to work in Ion Sancho’s office) on the Commission. Election law is complex, because it deals with issues related to federalism, constitutional law, campaign finance, politics, civil rights, and free speech. A person does not need to be an lawyer to understand election law, but it certainly helps. Of the twelve members, six are lawyers: Mike Pence, Kris Kobach, Christy McCormick, Hans von Spakovsky, J. Christian Adams, and Alan King. Half is a good ratio for the Commission. The Commission really should have included Rick Hasen, or Trevor Potter. Rick Hasen is the preeminent election lawyer in the country and runs the election law blog, which has been active since 2003: Election Law Blog. The rest of the Commission members have undoubtedly dealt with particular election law issues as they have come up during their time in government. One of the purposes of this Commission is to assess the security of elections, and that effectively means assess the technical security of our voter registration rolls and our voting machines. The technical problems in elections are related to privacy, information security, operational security, identity, double spend, and many other issues that are genuinely difficult technology problems. Laymen are not well equipped to assess particular technical problems/solutions in this space. Frankly, the fact that no computer scientists who have studied election systems are on the Commission is disappointing. Not one single member of the Commission has a technology background. None of them are trained computer scientists, electrical engineers, or mechanical engineers. Edward Felton, Ron Rivest, J. Alex Halderman would have been good choices. If the Commission has an Achilles heel this is surely it. What better way to know what voters want than to actually get elected to an office by them? By holding office a person has, at least in theory, to have interacted with voters and heard their concerns. All the members of the Commission have worked in government before, and in fact most of them have held elected office. Only three members of the Commission have not held elected office: Christy McCormick, Hans von Spakovsky, and J. Christian Adams. Perhaps this is not that large of a concern, but the reality is that those three members have never been held accountable to voters. There is a big difference between taking a position for an article published by your think tank, and defending that position to the man on the street. The Commission has some very experienced people as members, and some people who have very little experience with respect to elections. Judge Alan King is probably the most well-rounded member of the Commission. Hopefully, the Commission produces a report of value with a clear explanation of its methodology and results. Consensus, the blockchain conference of the year, starts May 22nd, and I am excited to be attending for the first time. According to Coindesk, there will be over 2000+ attendees, 100+ speakers, and over 20+ countries represented. Everything going on in the blockchain world will be covered, however, there are a few talks I’m most looking forward to. Initial Coin Offerings (ICOs), where crypto-tokens are offered for sale to fund a project, are a wild west of crowd funding these days for new blockchain projects. This talk should be lively as some people are convinced that these tokens are securities, and other people are convinced that these tokens are something new entirely. Falling Behind? Is the United States Fostering Blockchain Innovation or Sending it Overseas? Blockchain based innovation really is worldwide, and it is inherently focused on value exchange, whether that’s currency or assets. What is interesting to watch is how blockchain solutions are being adopted in various countries. This talk should shed some light on where the US stands in all this. Smart contracts are a huge part of why people are excited about blockchain. The ability to distribute trust, computation, business relationships, and more is on the horizon. These two speakers are in the trenches hammering out that future. Ultimately, I have no doubt the conference will be illuminating in many ways I can’t anticipate. I’m sure I’ll have more to write about what I saw and heard when I return. 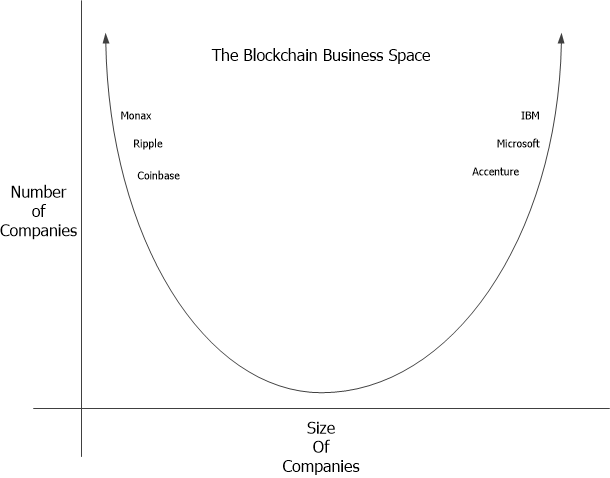 The blockchain business space is convex. By convex I mean that the businesses developing in the space are either large organizations, or small startups. The space looks a little like the graph below. This isn’t necessarily good or bad, it just is. On the right of the graph you have very large organizations, like Accenture, Microsoft, and IBM. On the left you have companies like Monax, Ripple, and Coinbase. Given the relative newness of blockchain technology the distribution of companies into two peaks, one of small companies and one of large companies, makes sense. Large organizations have the resources to test out new ideas without too much disruption to their business. On the other side, small companies have the agility, and often exclusive competencies, to try and build businesses around new ideas. 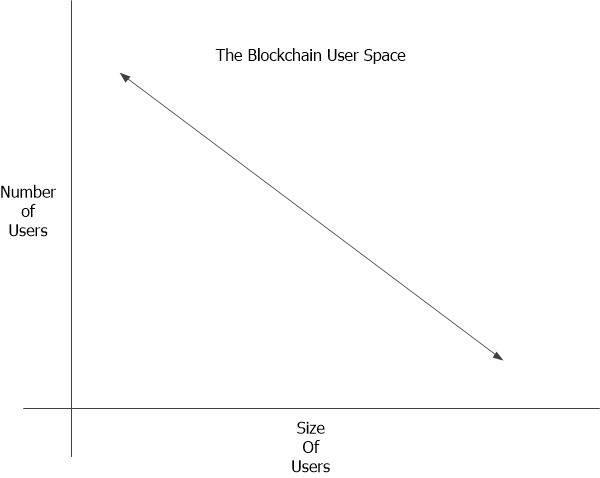 On the flip-side, the blockchain user space looks similar to the blockchain business space. The early adopters are largely very small users (e.g. individual holders of bitcoin), and large enterprise institutions. The chart is effectively the same as that for the business space. Until a “killer app” for blockchain is developed the chart above will not change, and widespread adoption will not exist. 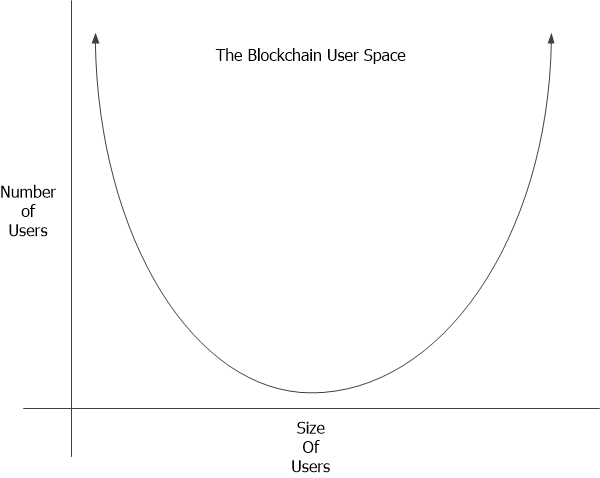 For widespread adoption to actually exist the blockchain user space will have to look something like the chart below. When midsize and small organizations are using blockchain, say a trucking company in southern Illinois or a local grocer in Argentina, then blockchain can be considered to have made it, but that is a long way off. I previously wrote about smart contracts showing up in patent filings over at Medium. I wanted to do an update to that post to see how many more filings have shown up. In the previous post on July 21, 2016, there were seven published patent applications that mention smart contracts. Rerunning the search on March 19, 2017, shows that there are now fifty-six published patent applications that mention smart contracts. This growth in filings is consistent with the rise in the number of patent filings that mention bitcoin, blockchain, and distributed ledgers. Patent filings show maturity in a new technology space, an issue I’ve discussed before, and smart contracts are proving to be no different. The chart below shows the growth on the horizon. 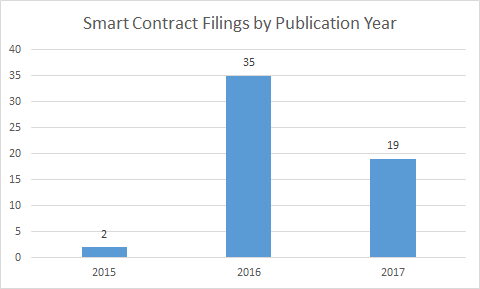 The number of patent filings that mention smart contracts published in 2015 jumps dramatically in 2016. Considering that the Ethereum project went live in late 2015, it is not surprising that we don’t see many filings in 2015. Now that Ethereum has proved itself, and use cases for smart contracts are being tested, there will likely be many more filings that mention smart contracts. Three months in to 2017 we are on track to surpass 2016, and probably see around 80 patent filings that mention smart contracts. Recently, I was having lunch with a friend who practices IP law in Buenos Aires, Argentina. He mentioned, to my surprise, that Argentina was not a member of the Patent Cooperation Treaty (PCT). 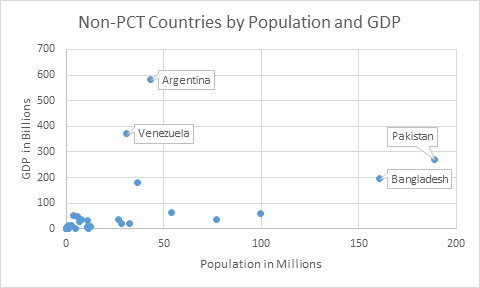 This stunned me, because Argentina is a large sophisticated country, and I assumed they would be a part of the PCT, because nearly every country in the world is a part of the PCT. A large part of the “international patent system” has to do with the PCT. The PCT makes it easier for people and entities to seek coverage for their inventions in multiple countries at the same time. As of December 8, 2016, there are 151 PCT Contracting States. So, how many countries are not a part of the PCT? For purposes of this post I am using the list of United Nations member states. According to that list, the United Nations has 193 Member States, which means there are forty-two non-PCT states. Some of these countries make sense, Democratic People’s Republic of Congo, some make no sense, Argentina. Who are these non-contracting states, and what are their economies like? 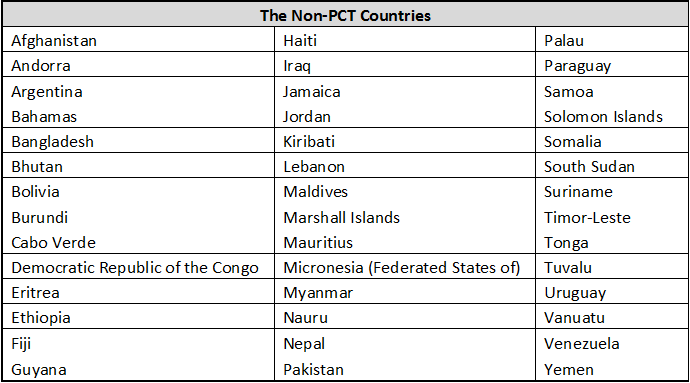 As of January 12, 2017, there are forty-two countries which have not signed on to the PCT. These countries range from the small to the surprisingly large. Many of the countries do not have a ton of economic activity, and conversely a few have considerable economic activity. Using data from the World Bank, the chart above plots all forty-two of the Non-PCT countries in the world by population in millions along the x-axis, and gross domestic product (GDP) in billions along the y-axis. I’ve called out some interesting outliers on this chart. Argentina, my friend’s home country, has the largest economy with a GDP of 581 billion to the country’s population of 43.4 million. Conversely, Pakistan is the most populous nation of the group at 271 million, but only has a GDP of 188.9 billion. Only five of the countries have a GDP over 100 billion (Argentina, Bangladesh, Iraq, Pakistan, and Venezuela), and only five of the countries have a population over 50 million (Bangladesh, Congo, Ethiopia, Myanmar, and Pakistan). The full list of countries is presented below. Of the countries listed, Argentina seems like the most likely candidate to join the PCT. In fact, my friend told me Argentina plans to join the PCT soon. The rest of the countries, I am not so sure. Negotiating an international treaty is cost intensive in both time and money. Frankly, many of these countries have much more important issues to contend with than patent rights.